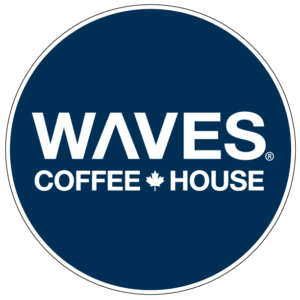 The Waves Coffee House franchise was founded in 2005 at Hastings and Richards Street in downtown Vancouver, British Columbia. The company has grown to 38 stores across British Columbia and Alberta – currently, these are the only provinces where Wave’s can be found. The coffee chain uses the best specialty grade beans from the top 10% of coffee grown in the best regions around the world. Every bean exhibits a distinct characteristic in aroma, flavor and taste and every outlet, big or small, is known for superior fresh brewed coffee, warm hospitality and incomparable service. In addition to coffee, Wave’s offers mochas, made with real Belgian chocolate (not powdered), rooibos iced teas, a variety of sandwiches, fresh wraps, hearty soups and delicate pastries. Check out the full scrumptious menu to see all the great creations. Many stores also offer the free use of meeting rooms and free Wi-Fi. Every Wave’s Coffee House prides itself in superior customer service. Warm smiles and friendly service greet you as soon as you enter the door. Use the store locator search box to find a location near you. But, if you do have a problem or complaint, the servers and managers will be happy to help you in any way. If you prefer to contact the company online, you can use the convenient contact page or send an email detailing your questions or complaints or maybe just to thank your server for a great experience. The company doesn’t accept phone calls. All customer concerns are handled by mail, fax or email. The fax number is 604-540-9299, long distance charges may apply. Send mail comments or inquires directly to the Waves Coffee House Headquarters, 715 Columbia Street, New Westminster, British Columbia, V3M 1B2. Find out about the Wave’s Reward Program. If you have a question not answered in the FAQ, send an email for more details. Catering inquires should be sent to Catering and for nutritional information, send an email to Nutrition. Stay connected with Wave’s Coffee House with Facebook and Twitter. Learn about great offers, special deals and limited time specialty drinks, like the Affogato – ice cream has never been served like this! Find out about special customer appreciation days, complete with face painting, photos, music and loads of fun. Wave’s is more than just a coffee house, it’s an experience to remember. Wake up with a Wave’s coffee in the morning and you’ll be smiling all day. Submit your review of the Waves Coffee House customers care service. Your e-mail address will not be published. All fields marked with * are mandatory. Do you work at Waves Coffee House? Claim your listing for free! Qith a Company account you can to respond to reviews, update your profile and much more.